Burgh Castle is a small parish, close to Great Yarmouth, and surrounded by low-lying marshland. The village is situated on a spur of land that was known as Lotheringland, and the archaeological history of the parish is dominated by its position on what was formerly a large estuary. The parish was in Suffolk until 1974, when it became part of Norfolk. Many prehistoric flint implements, including a Neolithic axehead (NHER 10470), scrapers and flakes (NHER 10468, 10469), have been found scattered throughout the parish, and a possible prehistoric flint-working site (NHER 31204) has also been identified. Several Bronze Age axeheads (NHER 17108, 17505, 18173) and palstaves (NHER 17504, 17505, 17506) have been found in the parish since the 19th century. Excavations by the Norfolk Archaeological Unit revealed a large Iron Age ditch (NHER 23720), probably a boundary ditch, which appears to cut off the promontory on which the present village stands, and Iron Age pottery (NHER 23720) and coins (NHER 24325) have been found. This suggests that Burgh Castle was of some importance during the Iron Age period, but no evidence of any settlement has been found. 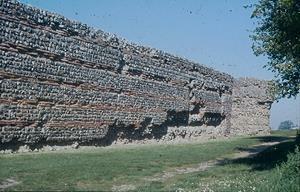 The Roman fort (NHER 10471) is Burgh Castle’s most well known landmark, and is an important survival of a network of similar forts, known as the Saxon Shore forts, constructed in the late 3rd century to protect the coast against Saxon incursions. The fort was called Gariannonum during the Roman period, but today it is known as Burgh Castle; ‘Burgh’ comes from the Old English for ‘a stronghold or fortification’. The probable site of a Roman vicus (NHER 10486) is visible on aerial photographs just outside the walls of the fort, and a Roman field system (NHER 13227) has been excavated by the Norfolk Archaeological Unit. The large number of Roman finds, including coins, pottery, brooches and more personal objects such as rings (NHER 10486, 11605, 15795, 17261) are the tangible remains of the daily lives of those who lived, worked and farmed in and around the walls of the fort. In the Saxon period the fort (NHER 10471) is thought have been the site of the monastery of St Fursey, founded in the early 630s. 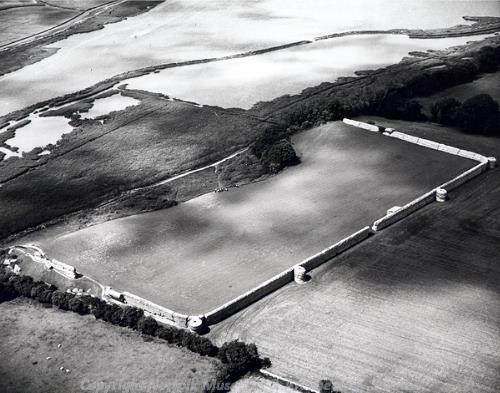 Bede records that St Fursey’s monastery was at ‘Cnobheresburg’, a name that has long been associated with Burgh Castle. Excavations by the late Charles Green within the fort revealed the remains of possible Middle Saxon buildings, and an Early Saxon cemetery (NHER 10471). Early Saxon brooches (NHER 17261, 38150), Middle Saxon coins (NHER 17261, 19308) and brooches (NHER 23796), and Late Saxon metalwork (NHER 22940, 23796), including brooches (NHER 17261) have been found in the parish. A Late Saxon field system (NHER 13227) has been excavated by the Norfolk Archaeological Unit, on the site of an earlier Roman field system. 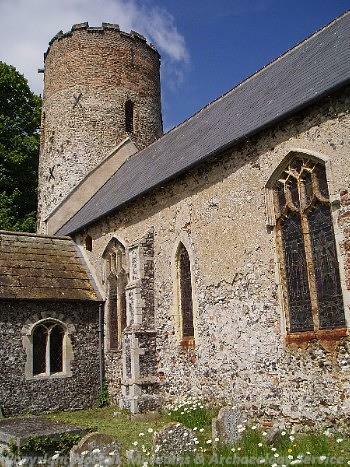 The parish church of St Peter and St Paul (NHER 10500) has a Late Saxon round tower, and parts of the nave walls may also date back to the Late Saxon period. In Domesday Book a church was recorded in the settlement, which was relatively substantial and wealthy. In 1086 Burgh Castle was held by Ralph the Engineer, who may have been the builder of the Norman motte and bailey castle (NHER 10471), which was built within the walls of the fort. The motte was demolished in the 19th century, but is still visible as a cropmark on aerial photographs. The medieval manor house (NHER 10400) may have been located on the site now occupied by the Queen’s Head, although no evidence of a medieval complex of buildings has yet been found. A timber beam is all that survives of St Peter’s Guildhall (NHER 31892). The beam is now kept in the church, and is carved with an inscription commemorating the rebuilding of the Guildhall in 1548 after an earlier building was destroyed by fire, and the 16th century Guildhall was demolished in the 19th century. During the medieval and post medieval periods, Burgh Castle remained a small village, as it does today. No main roads run through the village, and it was dependant on the vitality of the river trade throughout the medieval and post medieval periods. The saltpans recorded in Domesday Book may have remained an important industry in the medieval period, as well as cultivating reeds and osiers. Windmills (NHER 16381, NHER 31134), such as Burgh Mill (NHER 16363), enabled the drainage of the marshes, creating valuable grazing land and market gardening. The Laurels (NHER 41732) is a former nonconformist chapel, which may date back to the 16th century. The Grange (NHER 10402) and Old Hall Farmhouse (NHER 34079) are both 17th century houses, with substantial alterations dating from the 18th century and later. Burgh Hall (NHER 41731) was a large 19th century house, demolished in the mid 20th century. Brick making was an important industry in the parish in the 18th and 19th centuries, and at least three brickworks sites (NHER 31133, 31134) are known in the parish. The most well known of these is the Burgh Castle Brick and Cement Works (NHER 10501), which opened in the mid 19th century, and closed in 1912. The remains of the four kilns used in the brick making process are visible on aerial photographs. Burgh Castle now bustles with the activity of many other holiday villages on the Norfolk coast rather than with the efficiency of Roman troops, or the peace of Saxon monks, but the impressive remains of the fort are a constant reminder of the vibrant history of the parish. Sarah Spooner (NLA), 17 October 2005.